I came across this little essay on Lyndsay's blog. 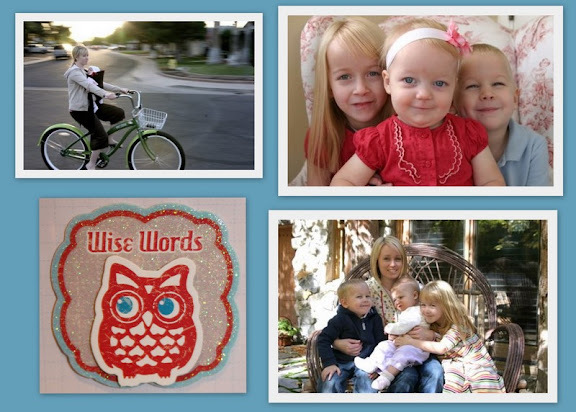 She "interviewed" fellow blogger, Stephanie, on what motherhood means to her. I just love this: I love that Stephanie is confident and has a knowledgable "plan" on how she wants to mother her children. I love that she is going against the grain of the times with the rejection of the hustle and bustle. After purusing her blog, I learned that she is a master swaddler (could we share this title?) and can't resist making banana bread with too-ripe bananas vs. just throwing them out. I have wanted to be a stay-at-home mom for as long as I can remember. I even majored in "Home and Family" for crying in the night! And let me tell you something, this life is better than I ever imagined it could be. I take my title of "stay-at-home mom" quite literally. I try to stay at home with my kids as much as possible. I am the lucky mother of 3 adorably perfect children. (I can say that because I am their mother.) Mabel, my oldest, is only 6, so my experience as a mother is somewhat limited. But as my children have grown, I have begun to realize that it is my job as a stay-at-home mom to create an environment that allows them to thrive. For me and my family, that means a slow-paced, home-centered existence. My goal is to create a life for my kids that is peaceful and calm. There is a lot of noise out there in the world. I want my home to be a refuge, a haven, and a place where that near deafening sound can be ignored for another day. As a stay-at-home mother, the home is my only domain, it is my favorite place to be, and I want it to be my children's, too. On the days that errands simply can't be ignored, get them done quickly and early in the day. This allows for an afternoon of relaxation spent at home, not fighting traffic and the hustle and bustle of shops. I think we all know how important family time is. Call me crazy, but I really believe that quantity is more important than quality. My kids are not currently enrolled in any extra-curricular activities. But they are still young, so I know this won't last forever. When they are older, and show an interest in things, I will try to limit their involvement a bit so that it doesn't interfere with family time. Eat dinner together as a family every night. It doesn't always have to be a spectacular meal, but this is a good habit to start. A couple years ago, I read an article in Time Magazine called The Magic of the Family Meal. In it, I learned a few things, like the fact that young children pick up vocabulary and a sense of how conversation is structured during family dinners. They hear how a problem is solved, learn to listen to other people's concerns, and respect their tastes. They learn to share. Family dinners give kids a sense of belonging to their family. This is where a family builds its identity and culture. Legends are passed down, jokes rendered, eventually the wider world examined through the lens of a family's values. Not to mention that families who eat dinner together tend to eat much healthier. Getting the kids ready to leave the house is always something of a process, and I can likely be found hurrying my children along. But I'm rarely in an actual rush, so I remind myself that it's ok to slow down. It's ok if it takes Oliver 5 minutes to put on his shoes. A trip to the grocery store, or Nana's house, or wherever can wait 5 minutes. Become a firm believer in doing nothing. I think kids need their own space and time to do what they want to do. At our house, "doing nothing" includes, but is not limited to: playing, coloring, reading, writing stories, building forts, having "quiet time" (code word for naps), or running around the backyard. Doing nothing is unstructured time where my kids get to choose want they do, and I don't bug them. I am lucky that my two oldest are the best of friends. They are more than capable of keeping themselves entertained, which is a great skill for all kids to learn, even babies like my Stella. In order to maintain a peaceful home, I really believe you have to have a clean home. Some days I feel like I spend my life cleaning. Other days I feel like my house is a major disaster area and there's no hope. But for the most part, I try to stick to a cleaning schedule (Mondays I do bathrooms, Tuesdays I dust, etc.). This keeps my neat-freak tendencies in check, and it means that I always have a relatively clean house. One of my favorite cleaning activities is to putter. This can be done any day, for any amount of time. While my kids are busy "doing nothing", I am busy "puttering", which means walking from room to room picking up, throwing away, and putting things back where they belong. Most of the time I count this as my exercise for the day, and I get the added benefit of having an organized home. Speak softly, turn off the tv, and listen to pretty music. I was raised by wonderful parents who never yelled. Not once. Their example has inspired me, and I try not to raise my voice at my children. Again, there is enough of that out in the world. I believe that being a mother is a great privilege and blessing. It is my duty to be the best I can be. Somehow, I don't think raising my voice at these tender little people is fulfilling that sacred calling of motherhood. When my children watch tv, I try to limit it to one or two 1/2 hour shows a day. It's just more noise. And I love to have music playing in our home. It is usually something mellow, but every once in a while something with a good beat comes on and we let loose. Editing the noise you allow into your home from the outside world is so important. If perchance you, my dear reader, are a high-energy person, or you are a true supermom and juggle work and home life, don't fret. It is possible to create a peaceful environment even if you like running errands in the afternoon, or listening to rock music, or you have a 9-5. The trick is to find a routine that works for you and your kids and to stick to it. Kids crave stability and attention. If you are giving them the routine and the constant, unconditional love that they need, things are going to be pretty all right most of the time.This much I know, babies don't keep and children grow too quickly, so try to enjoy being home with them now. They will only be content to stay at home for so long, so I, for one, am drinking it up and soaking it in. I really like reading this too. Even though I don't stay at home with my kids it was in inspiration of how to use my time with them when I am home. Thanks for sharing. Love your blog. I would like to meet the Saints that raised this women who never yelled at their children....once! HOW can that be? Saints I tell ya! Sweet sweet Saints. My path to "sainthood" is a big work in progress. Yelling..yes. But I know it doesnt work to yell and I also am working on that. Who likes to get yelled at? I must say I do not remember my grandmother ever yelling. She is also one of those saints. I read this post too and was in awe! I think my comment was "can I have a do over?" Yup...I want to do it all over again with Stephanie's attitude. Although I did keep my children completely out of sports until 6 years old so our Saturdays could be lazy family mornings. Selfish?..I didn't think so! I enjoyed reading about Stephanie...I remember a day when I felt it necessary to tell people that I "USED" to be a teacher...feeling the need to say I went to college and I had a "JOB". Now, it's funny, I am content....being at home is the only job I want...and I am giving up my other commitments at school and church as I speak....I realize that this is the time that my kids need me most...and being the Market Day mom etc..doesn't make me a better mom.....just a little more stressed about something that doesn't affect my kids! Thanks for the good story! thank you for posting this lovely writing. i'm headed off to her blog. enjoy your monday. Oh my...I love this post and I love the photos and I love your new header. I love "vintage parenting!" Great post! Love your blog. I am decorating with the heart lollipops like those in your header. LOVE the $ section at Target! Have made a few cute crafts from items there! You are amazing Sarah! Always something inspiring over here. I love this post! I think we all want peace in our homes, so this is good advice. Enjoyed this post immensely- yes I am a stay at home mome too!!! Stephanie makes a lot of sense. The slow down part is a challenge for me!!! Thanks for the reminder- off to check her blog. Always such great stuff on your blog! I awarded you the "Kreativ Blogger Award" because you are one of my favourite bloggers...no doubt you may have already received it...it is much deserved! I love it!!! I was a stay at home mother most of the time our children were growing up. I always refer to myself with great pride as a "domestic goddess". Now my children are grown and some have to work so I'm grandma mama for the time being and am back to my glory days. Nothing is more important than these babies. No yelling? hmmm.. . I'm guessing she is not of Italian or Greek heritage? The only thing she didn't mention was a good long laugh each day. At yourself, your kids, a show. Laughing is number one on our list for a recipe for great parenting. I'll take that over dusting any day. Although, clean is good too, as long as you can laugh while you're doing it. Love the 'vintage parenting' post! People often look at me like I have two heads when I tell them my children are not involved in activities (although my youngest just recently began gymnastics so I guess I can't say that anymore). Just though I'd let you know I've written a post that was inspired by your post on parenting here. I've link back to it for anyone who wanted to see my inspiration. It's a bit of a different spin. I'm new to your mom, having found it through mommycoddle and let me tell you what, I love it! This post makes me proud of all you supermommies out there. Though I don't have kids yet, I sure hope to join your ranks soon enough. This was really insightful and inspiring. This is lovely. But i wonder if anyone out there shares my experience. I love this vision of motherhood. It is mine too. I enjoy pottering around at home, a bit of tidying, bit of cooking or a bit of crafting. I am a quiet person and can't live without some quiet time. My youngest child is contented with this too and generally finds having to go anywhere an unwelcome distration from his games. My oldest though seems to fall into something close to a depression on these kind of days. She is now 7 and has always been like this. I've come to believe that I am never going to be able to 'teach' her to be any different. She just needs a lot of entertainment! and drawing, crafting, reading are not her idea of fun. I have to admit that I do get frustrated, especially in the school holidays. But having a stream of friends round or some organized activities seems to be the only way to go. Thank you for this post. I have 1 child right now (he's almost 9 months old) and I am finding myself in a great struggle with the expectations of those around me as I try my hardest to keep a peaceful, gentle home. Thank you for reaffirming why I do what I do and making me believe that I can continue to do it whenever #2 makes his/her appearance!